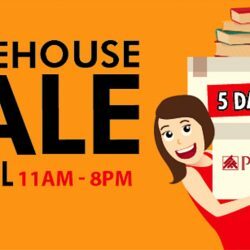 Are you ready for the POPULAR Warehouse sale which starts TOMORROW? From 30 Aug - 3 Sept, enjoy up to 90% off selected Stationery, and Gadgets & IT products at the sale! 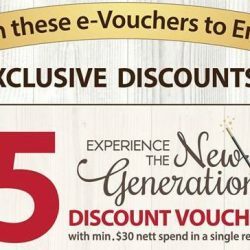 Receive $30 FREE CASH vouchers when you spend $30 nett on Chinese and English books! Easily accessible by car and public transport, make a date with your friends and family for fabulous buys at the POPULAR Warehouse Sale! 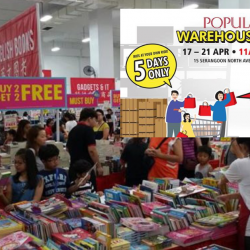 12 - 16 Apr 2017 POPULAR Bookstore: The POPULAR Warehouse Sale starts today with up to 90% OFF on selected Stationery, Books and CDs! The POPULAR Warehouse Sale starts today! Simply purchase $10 worth of Chinese books and you'll receive $10 worth of CASH vouchers! That's not all, you can also enjoy up to 90% off on selected Stationery, Books and CDs! 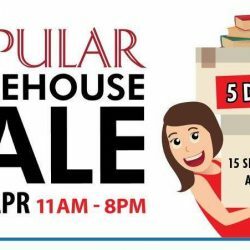 Many juicy deals await you, so head on down to the POPULAR warehouse sale from now until 16 April! 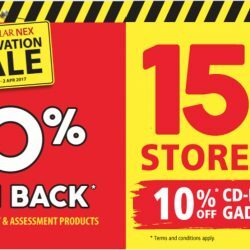 Till 2 Apr 2017 POPULAR: Nex Renovation Sale with 50% Cashback on Selected Stationery & Assessment products, 15% OFF Storewide & 10% OFF on CD-RAMA and Gadgets & IT products! To enhance your shopping experience, POPULAR Nex will be undergoing renovation in April, but not without a Renovation SALE first! From now until 2 April, enjoy 50% CASHBACK on selected stationery and assessment products, 15% discount store-wide and 10% off on CD-RAMA and Gadgets & IT products! Make your purchases with NTUC/OCBC Plus! Visa Card when you spend a minimum of $80 nett in a single receipt to receive $5 CASH Voucher and $10 worth of vouchers. See you at POPULAR Nex! 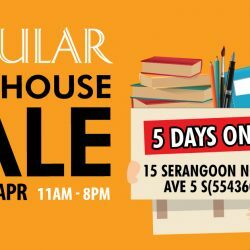 10 - 19 Mar 2017 POPULAR: Buy 1 Get 1 FREE Books, Stationery, Assessment Books & More! Calling all book fanatics! Dun miss this Buy 1 Get 1 FREE sale exclusively at POPULAR Bras Basah Complex happening from today till 19 March 2017! Offer is applicable to selected books (over 5,000 selected titles), stationery, assessment books, CD-Rama and gadgets & IT products! Also enjoy 15% off storewide on stationery and assessment books with purchase of any English/Chinese book! Something FEBulous is coming your way! 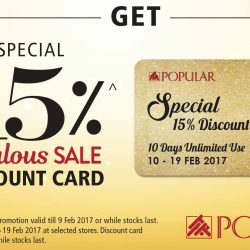 Simply spend $30 in a single receipt at POPULAR from now till 9 Feb 2017 to receive a special 15% discount card for UNLIMITED use from 10-19 February! Limited quantity available, hurry down to your nearest POPULAR store today. 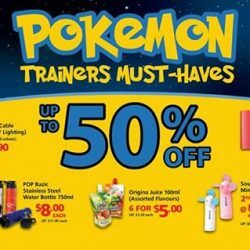 The weekend is here, don’t go Pokémon hunting without these essentials! Enjoy up to 50% off on selected items at all POPULAR stores. Valid till 31 August. T&Cs apply. MEGA offerings, MEGA savings! 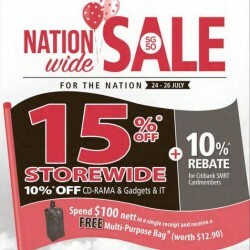 Enjoy 15% off storewide, 10% off on CDs, gadgets and IT products! Enjoy up to 70% off these amazing star deals! Hurry down to participating POPULAR stores this weekend to get them before they’re gone! The POPULAR Mega Sale starts from 12 August to 21 August at the following POPULAR stores: Bras Basah Complex, Marine Parade Central, Toa Payoh, Jurong Point, Causeway Point, Northpoint, Tampines Mall, Nex and Lot One. Only 4 more days to the launch of Harry Potter and the Cursed Child! Remember to visit us at POPULAR Bras Basah on 31 July, 7.01am and redeem an exclusive DOOR GIFT PACK worth $10 with products and meal voucher from Staedtler, Haribo and Prata Wala! 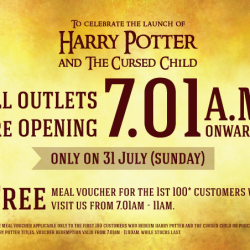 Popular: Grab your copy of Harry Potter and the Cursed Child Book on 31 July at 7.01am & Get a Free Meal Voucher! To make it convenient for you to get your copy of the Harry Potter and the Cursed Child book, all POPULAR stores will be opening at 7.01am on 31 July! Receive a FREE meal voucher when you visit us from 7.01 – 11am. 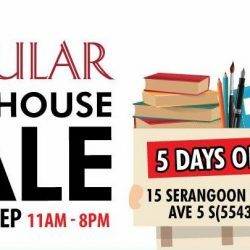 The POPULAR warehouse sale is happening for 5 days starting from this Wednesday, 6th to 10th July 2016! Enjoy up to 80% off stationery, books and music and assessment books from $2 only! 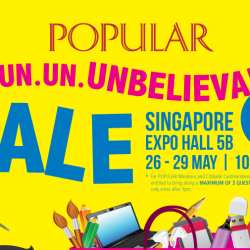 The Popular Un.Un.Un.Unbelievable Sale is happening from 26 to 29 May 2016 at Singapore Expo Hall 5B! Popular members' and Citibank Cardmembers together with up to 3 guests can preview the sale on 26 May, from 10am to 3pm. Enjoy up to 60% off books, stationery, gadgets & IT and music at the sale and promotions like Buy 2 Get 1 Free and more! 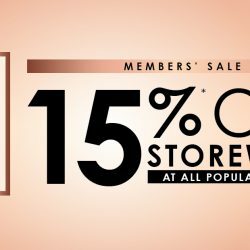 Enjoy 25% off storewide at Popular's Members Closed Door Sale! Happening from 21 to 22 May 2016 at Bras Basah Complex! Not a member? Don’t fret, come on down and find out how you can join for FREE and you can enjoy the privileges too! Good things come in pairs! It's always more fun to shop with a buddy. 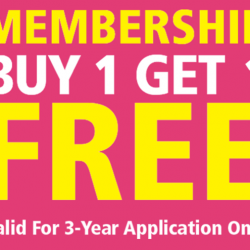 Sign-up or renew a 3-Year Popular membership now and your friend can sign-up for FREE! What’s more, receive a $10 POPULAR Gift Voucher when you make your payment with Citibank SMRT Credit Card. All terms and conditions apply. Head down to POPULAR @Bras Basah Complex now! The school holidays are here! So you know what that means - the beginning of the POPULAR Super Holiday Sale! From 11th to 20th March, enjoy 15% off stationery items and get up to 10% savings when you pay with Citibank SMRT Credit Card. 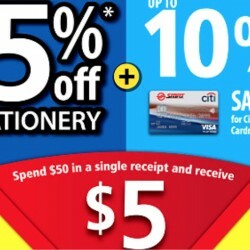 Spend $50 in a single receipt and receive $5 voucher. So drop by participating outlets and check out the fantastic deals up for grabs! Terms and conditions apply. The POPULAR MEGA Sale is now on! 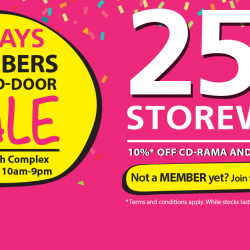 From 19 - 28 Feb, enjoy 15% off (10% off for CD-RAMA and Gadgets & IT)! Even Better – get 5% savings when you pay with Citibank SMRT Card or Maybank Family & Friends Platinum MasterCard! 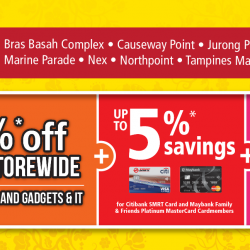 So hurry down and check out the fantastic deals at our participating outlets now! 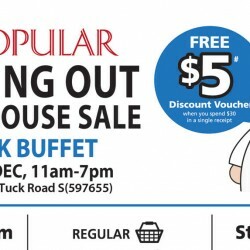 Don’t miss Popular's Moving out warehouse sale happening on 24-27 Dec! Books are from $2 onwards, and stationery are up to 70% off! Also grab a basket of 15 books at only $30 or 30 at $50 only! Get a free $5 Discount Voucher when you spend $30 in a single receipt. 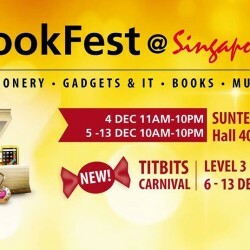 Book lovers, this is an event that you must be anticipating, [email protected] 2015 - the largest annual book and stationery fair in Singapore! Returning to Suntec Singapore from 4 - 13 December 2015, the event will take place across two weekends during the school holidays. Covering 120,000 sq ft, the BookFest serves as the perfect one-stop shop for you to get your favourite products. From books to stationery and even household items, there’s certainly something for everyone! Book lovers, dun miss Popular's [email protected] Sale happening from 3 to 6 September 2015! 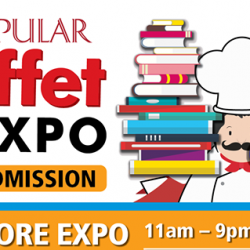 Admission is free and you get to create your own deals by getting a buffet of books for a very low cost! 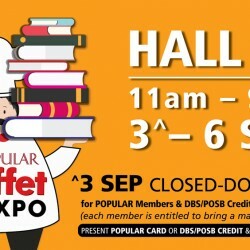 3 September is a Closed-Door Sale day only for Popular members and DBS/POSB Credit & Debit Cardmembers which I'm sure the majority of us have! So head down to Expo early to catch the popular books while stocks last! 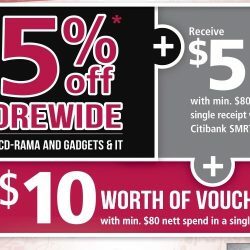 Enjoy nationwide sale for the nation and get up to 15% off storewide plus 10% rebate for Citibank SMRT carbmember and spend $100 nett in a single receipt and receive a free Multi- purpose bag worth $12.90.